The Stars Group Inc. agreed to buy Sky Betting & Gaming in a deal valued at $4.7 billion, the biggest acquisition yet by Chief Executive Officer Rafi Ashkenazi as the owner of PokerStars moves to create what will be the biggest publicly listed online gambling company. Toronto-based Stars Group will pay cash and stock to owners CVC Capital Partners and Sky Plc, it said Saturday in a statement. The company expects to achieve $70 million in cost synergies. The deal, the biggest since Stars bought PokerStars for $4.9 billion in 2014, opens new streams of revenue for the company and increases its exposure to sports betting — the fastest-growing online gaming segment. It’s a bold move under Ashkenazi to bolster his firm’s scale after the company previously failed to take control of Sky-rival William Hill Plc in 2016, which would have given Stars access to the core U.K. market. Yes, this is about poker. It isn’t about my recent hands. It is a modest bit of plagiarism. You know! like all my poker posts in the past. It is about someone we (poker players) all remember — Miss Ultimate Bet shill. I had no thought of writing a blog today. That change a minute ago. I read a blog from the old days of poker. Like many — including mine — it transition from talking about poker to something else. The blog I am mentioning is Brad Willis’ own blog — Rapid Eye Reality. The blog post I’m referring to is Atlas Mugged. Fans of poker know that it is a game which requires a lot of skill to compete at the highest level, but also requires some luck. 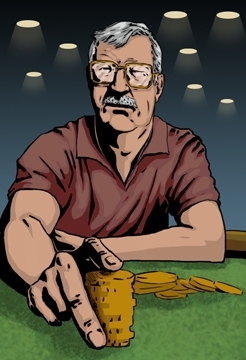 Players try to play as much as possible and thanks to online casinos, they can compete 24/7.